Planned Parenthood Has Sued the State. Find out Why. Planned Parenthood sued Louisiana last week, complaining about the state's "delay" in giving the group an outpatient license to sell abortion. Dan Fagan wrote a great piece about this in The Advocate yesterday. There is no doubt Planned Parenthood is on a mission to dramatically increase abortions in NOLA, and, as they always do, they are resorting to the courts to impose their will. Many people still do not know the truth about Planned Parenthood. Remember, 9 out of 10 pregnant women who enter a Planned Parenthood abortion facility purchase an abortion. Make sure you tell others the truth! P.S. We hope you enjoy our refreshed e-newsletter and website! Kudos to Sandy Cunningham, our Communications Director, for her work in leading this effort! We are always open to your ideas! 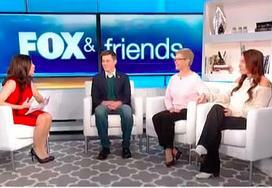 The past few weeks have been busy for the I Lived on Parker Avenue team, highlighted by an appearance on Fox and Friends . The documentary will be released free online on March 8, but before that, a final public pre-release screening will be held Wednesday at 8 p.m. at St. Alban's Chapel on the LSU campus. Gov. John Bel Edwards will also host a closed Red Carpet Premiere at the Governor's Mansion Tuesday night. Have You Seen Our New and Improved Website? It has been 10 years since we launched our first website, and while that site served us well, it was time for a facelift. We have been working on this site a number of months, and we are excited to share it with you. Our redesigned website includes the information we provided before, but it has a fresher look and feel, with simplified menus and an easier navigation system. The home page offers a look at what’s going on and has quick links to events, donation sites, the store and more! The first Acadiana Life Fest, set for April 21 in Lafayette, will be a pro-life, family-friendly celebration complete with a 5K, live music, food, booths, activities for children and more! Bring your friends and family to celebrate the Joie De Vivre! Bowties for Babies: A Southern Style Soiree for Life is April 17 at the Capitol Park Museum in Baton Rouge. Patron packages start at $250, and ticket prices start at $75. There will be music, food, a silent auction and more! The Louisiana Pro-Life Oratory Committee sponsors a pro-life oratory contest among high school juniors and seniors from throughout the state. 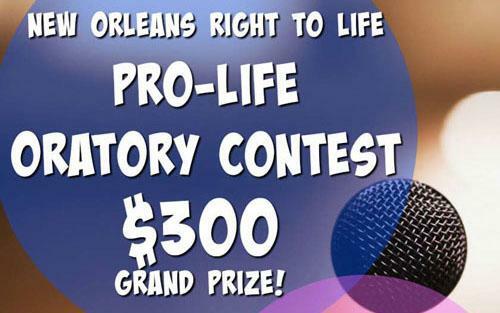 The New Orleans contest is Thursday, March 22, at 6:30 p.m. at the Louisiana Right to Life headquarters, 200 Robert E. Lee Blvd. Call 504-835-6540 for more information. 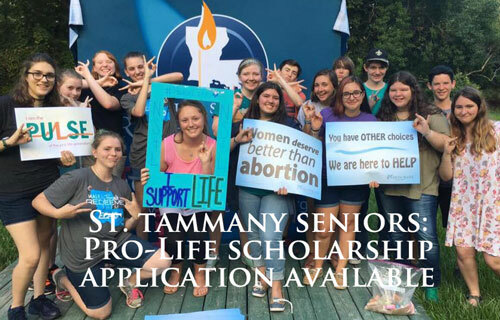 St Tammany Right to Life is currently taking applications for the St. Tammany Pro-Life Youth Leadership Award, a one-time, $500 scholarship for a graduating senior (in May) who lives in St. Tammany Parish and attends a St. Tammany high school or is home schooled. Applications must be postmarked by March 30. Nearly 60 high school and college students from Louisiana gathered at Camp Istrouma in Baton Rouge over the weekend to learn more about becoming pro-life leaders in their schools and communities. 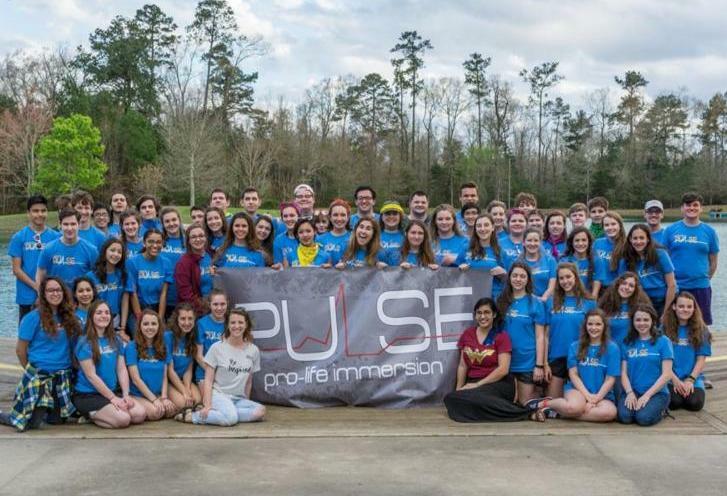 We look forward to seeing many of these students return and bring friends to PULSE Immersion Weekend in Covington, March 23-25 and PULSE Leadership Institute in Baton Rouge, June 18-22! 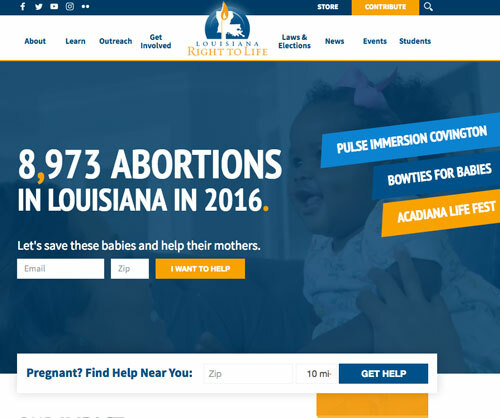 As a part of our new website, there is a page dedicated to the state's pro-life chapters. But in many cases the information we have in out of date. 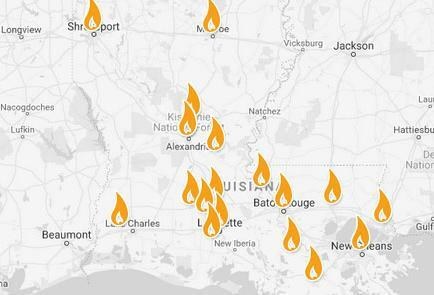 Please check your parish's chapter information and let us know if it needs updating. Also, if your chapter has any events or other information to add, please include that as well. Send corrections and chapter news to sandy@prolifelouisiana.org.